Every year across Japan, people line up at Kentucky Fried Chicken joints to place their orders for Christmas dinner. The yearly ad campaigns and meal ordering has made KFC part of Japan’s holiday season. 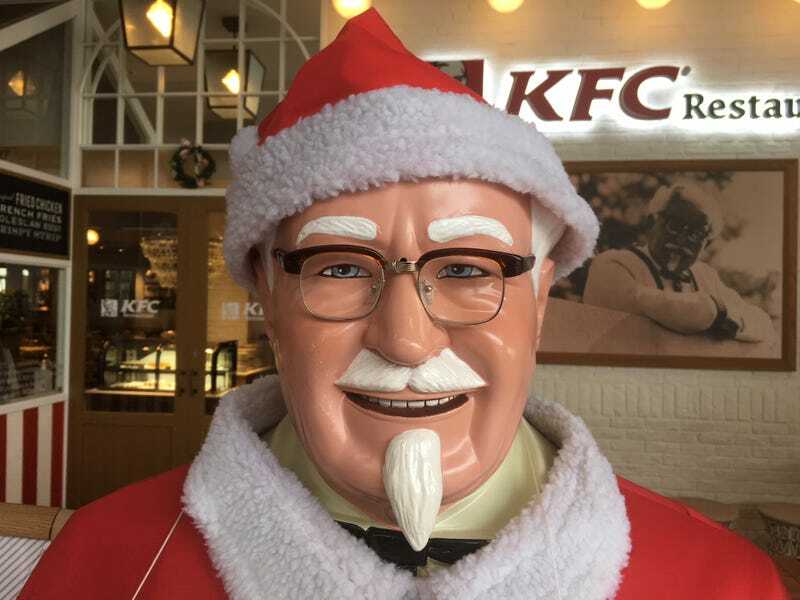 This Twitter user writes, “If we’re talking Japanese Christmas, it’s gotta be KFC!” Of course, not everyone eats KFC at Christmas in Japan (not everyone celebrates Christmas! ), but the fast food chain has become inseparable from the day. Kentucky Fried Chicken has been in Japan still the 1970s, and people in Japan love its chicken. But why is there this connection between KFC and Christmas? In many countries, Christmas evokes images of a home-cooked meal—not fast food! But Christmas, while celebrated, is not a national holiday in Japan. According to one explanation, the reason is that foreign tourists in Japan during Christmas couldn’t find turkey, so they went to KFC. I’m not so sure about that, because roast beef, another popular Christmas meal, is easily found. The official explanation from KFC is that a Christian kindergarten in Japan wanted to order KFC for its kiddy Christmas party. The school reportedly ask the KFC shop manager to dress up as Santa Claus for the party. He agreed, appearing at the party in full Santa gear, saying, “Merry Christmas” to the children’s delight. According to KFC, gradually, more and more schools ordered KFC for their holiday parties, and in 1974, KFC held its first special Christmas meal campaign. Decades later, KFC’s Christmas has become an annual mainstay, with people growing up eating the fried chicken during the holidays and naturally associating it with Christmas. And this year, like every year, expect lines.